Queensland centre Justin Hodges says his final Origin match will provide him with his greatest memory and is confident he leaves the Maroons backline in good shape. Hodges produced another strong effort for Queensland, his final appearance in the Maroons jersey, as the home side romped to a record 52-6 win over New South Wales at Lang Park on Wednesday night. 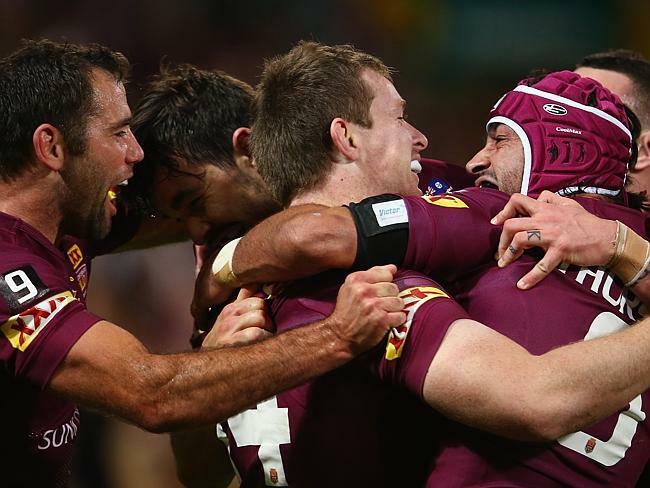 The 33-year-old said it was no doubt the greatest Queensland win he has been involved in during his 23-game Origin career. "To win like that against a quality side at home is unbelievable," Hodges said. "To leave on those terms in a game like that in front of family friends gives me great satisfaction. "This group of guys have showed so much toughness through injury and old age, so it was great to bring the shield home." Hodges' only regret was not scoring a try but he set up a spectacular one just after half-time for team-mate Matt Gillett when he miraculously flicked a ball back before he stepped over the dead-ball line. "I was just making sure I had my feet in play and I didn't know who was behind me, I just tried to flick it back," Hodges said. "When I spun around I saw Gillo put it down. It was a special play and GI (Greg Inglis) did the same thing, he makes it look so easy. Hodges missed out on scoring a try but he did kick his first Origin goal when Johnathan Thurston handed him the kicking duties for the final conversion. In doing so Thurston missed out on a Queensland single game point scoring record, after kicking nine from nine and finishing with 18 points equalling Lote Tuqiri's record scored in Hodges' first match for Queensland in 2002. Young backs Will Chambers and Dane Gagai (on debut) did score tries and it is that pairing that Hodges is backing to successfully fill the hole the veteran centre leaves on the right side of the field. "Dane and Will have always had the talent," Hodges said. "Those guys are going to be unbelievable on the right side together. They are going to take over my role and it is going to be great to watch them grow as players." As Hodges stood for the national anthem before his final Origin game he said a prayer for his aunty Cheryl who passed away last week. "She was my closest aunty, like a second mum," Hodges said. "I said a prayer and wanted to make sure she was there with me." Hodges heads to Cairns on Thursday to say goodbye with his family at his aunt's funeral.